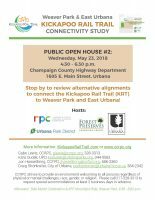 Along with the Urbana Park District, Champaign County Forest Preserve District, and City of Urbana, the RPC hosted another public open house concerning the Weaver Park & East Urbana Kickapoo Rail Trail (KRT) Connectivity Study on Wednesday, May 23, 2018, from 4:30pm to 6:30pm. This open house took place at the Champaign County Highway Department (1605 E. Main Street in Urbana). For more information, please contact Gabe Lewis. For those who were unable to attend the open house but would still like to provide input, please review the exhibit boards and complete the comment form by Thursday, May 31, 2018. Continuing along the railway is the obvious solution. The railway is hardly ever used and you only have the Main St. and Smith Rd. intersections to deal with. Where feasible, consider tunnels/overpasses to cross busy roads. This can be taken all the way to downtown Urbana (Broadway Ave.) with the overpass over Vine. Paths beside roadways are essentially sidewalks. Sidewalks are appropriate for pedestrians, not cyclists. Drivers are not expecting bicycles moving at high speeds on a sidewalk, particularly bicycles coming from the opposite direction that they are looking for motor vehicles. I have been harassed by drivers on the part of Washington that does not have a bike path. Why does this not have at least Sharrows if not a path? This is part of the corridor in your plan. Even with the usual harassment that I can get on Washington, I find it better than trying the E. Main where cars are traveling way to fast around the corner. The path really needs to use the railway into town and have overpasses or underpasses. The problem with Main St. is that the bike lanes are never clean. I’ve seen the street sweeper go down the car lane, but not do a second round to clean the bike lanes. I ride in the car lane. I don’t care who beeps or yells. I’m not getting a flat tire because the street sweeper is instructed to clean the car lane and leave the bike lane filled with gravel, broken glass, etc. The city doesn’t care about the Main St. bike lanes. I feel the community would wecome the parks being connected. The best solution may take more investigation. The Northern Southern Railroad to Smith Road (Alternative #4) should be pursued first, with the long-term vision of extending the trail through Champaign and providing linkages to Ambucs, Leal Park, Crystal Lake Park, and the University Avenue and Main Street business districts along the way. The Main Street bikelane extension should be completed, but it is not to be expected that this will ever see other than experienced and confident users. Hopefully the number of these users will be continuously increasing!